For long term health it is really important to consider all aspects of your life. If you make healthful choices with regard to activity and food consumption then your risk of getting cancer will be reduced. 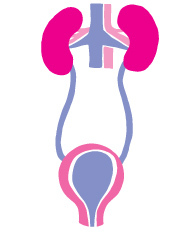 CRUK estimate that up to 40% of cancers are preventable. 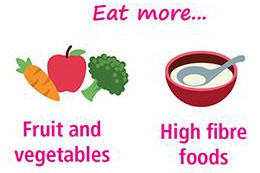 Healthier diets could prevent 1 in 10 cancers. There is strong evidence to suggest that eating food rich in fruit and vegetables can reduce the risk of mouth larynx and lung cancer. Likewise there is evidence to suggest that a high fibre diet reduces the risk of bowel cancer. However, many people incorrectly believe that taking supplements with vitamins can replace those found in fruit and vegetables and this is simply not the case. Food needs to be eaten in its natural form as supplements do not reduce the risk. 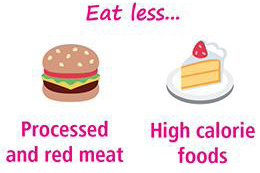 A diet rich in red meat or processed meat has been linked to an increase in bowel cancer. Red meat has also been linked to pancreatic and prostate cancer. There is good evidence to suggest that being physically active reduces the risk of bowel, breast and womb cancer as well as many other diseases. People that are active can actually cut their risk of bowel cancer by about a quarter. Diet can also help. Being overweight can increase the risk of 13 cancers. 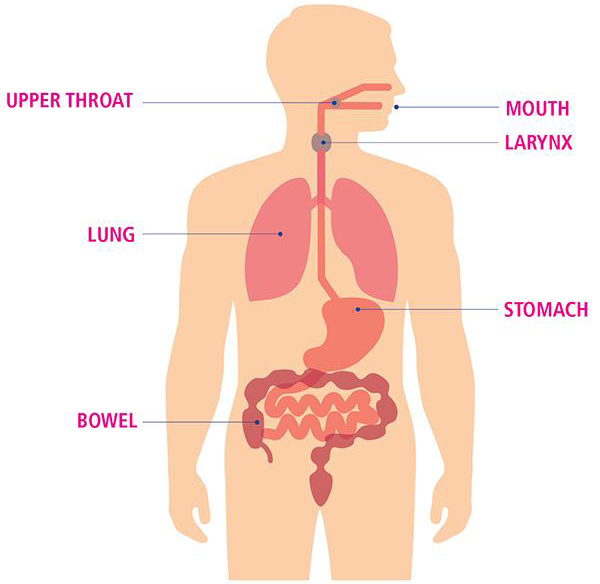 Tobacco use increases your risk of getting a number of cancers including lung and bladder cancer. Stopping smoking will increase your health in many ways including improving your ability to exercise or longer periods of time. To access a Stop Smoking programme. Please contact your local health centre and speak to the practice nurse about the benefits of smoking cessation and the support available on the NHS. There are a number other sources of community support. Below are a few of the more commonly used resources. There are however, many more available. Well person clinics are often run by your local health centre. They are not a replacement for seeing your GP of you feel unwell. The Here for Health Centre is here for you to drop in, for information and advice on healthy living and how to reduce your risk of ill health. The Here for Health Centre is a Health Improvement Advice Centre for patients, staff and visitors. The public are welcome to drop in for a 'mini health MOT', information and advice on healthy living and wellbeing, and how to reduce your risk of ill health. The team can offer you a consultation tailored to your individual needs, to make it as easy as possible to adopt small, sustainable and realistic lifestyle changes to improve your health and wellbeing. They have a wide range of resources to help you access a variety of community services, and have referral pathways set up to make it as easy as possible to get involved. 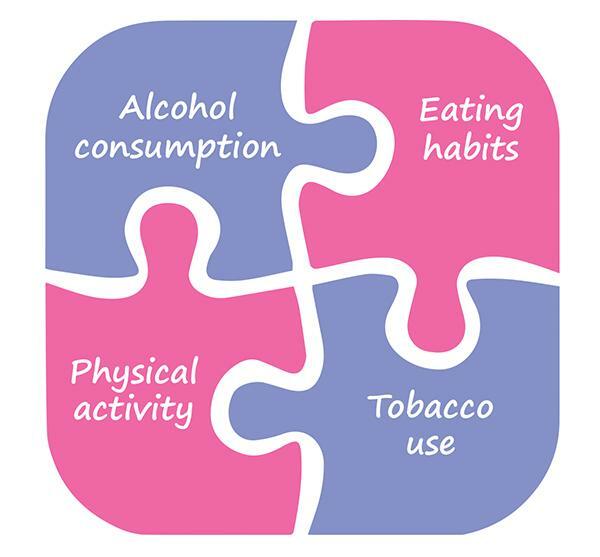 This includes free weight management support, physical activity incentives and free smoking cessation support. Healthwise is a 12-week physical activity programme that introduces individuals to the benefits of physical activity to help reduce risk factors for chronic disease and manage existing medical conditions. The programme is designed to encourage people of all abilities to become and remain more physically active, help increase fitness levels and improve health and wellbeing. Healthwise provides a welcoming, safe, affordable and accessible service to those who may not have entered a leisure centre before. If you ask your GP about this you may find there is a centre in your community to which you can be referred. Mindfulness is a technique you can learn which involves making a special effort to notice what is happening in the present moment (in your mind, body and surroundings). You do not have to be spiritual to try it. Mindfulness can be practiced by children, young people and adults. There are different ways to practice mindfulness. Group courses run to practice mindfulness in person and there are online courses too where you can learn through self-directed practice at home. You can use books or CDS to practice Mindfulness and it is now frequently used in schools to encourage children to cope with complications and stressors of life. It is a really important skill. Oxfordshire Mind run courses too please look at their website to find out more. The good news is that you are now twice as likely to survive for at least 10 years after a cancer diagnosis than you were 40 years ago. However, people who have treatment for cancer often are left with ongoing needs and side effects. Even when they have finished treatment you may find you are struggling to cope with every day life. 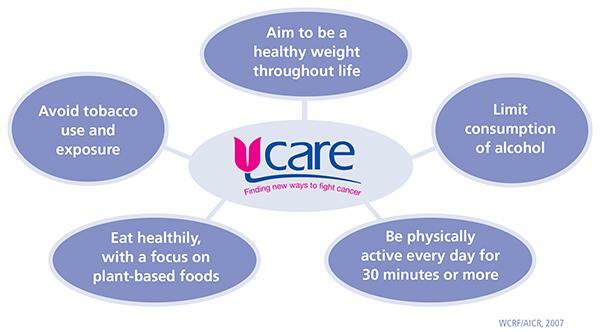 UCARE does not believe that support should end when treatment ends and there are some simple interventions that can enhance your life significantly post treatment. Look out for our Survivorship events that we run for those people that have had cancer. We also encourage you to bring your carers/ partners or a good friend with you. Acupuncture, Massage and Aromatherapy are all alternative therapies. All of these therapies are really important and can complement your treatment. Please discuss whether they will interfere with your specific type of treatment. UCARE offer a free service to businesses. We offer businesses the chance to have UCARE provide them with a programme to support the Health and Well Being of their Staff. This is a priority for workplaces and is now increasingly more important. Businesses need to be thinking about the health and well being of their staff and how best to support them. A healthy staff is more productive and also much happier and therefore retention will also be higher. Allow us to support you in the care of your staff. Our programmes are comprised of the following. We have been very lucky to have the opportunity to work with the Amplified Group. Amplified Group advisers specialise in developing leadership, generating team alignment and energising organisations for change. They have supported and enhanced some of the projects we are working on. They are mainly focussed on Business and improving the way that teams work. Please contact Gemma if you would like to hear more about the work we are doing for businesses or if you would like to volunteer to be involved in any of the work we do within the community.